Google Latitude is available on your iPhone via Safari (e.g. a web app) and not as a native app. The browser requests the user for permission to access the phone's location API. This morning I came across this interesting and well-written article on the current state of affairs with regard to mobile app stores. I think the author’s forward looking comments are reasonable if you limit your outlook to a year or two, but there are a couple of things to consider with regard to app stores in the long term. First, the common presupposition made is that app stores will remain a relevant if not primary way users obtain apps for their phone. From a purely technical perspective I would suggest we should not ignore the possibility that rich Internet apps eventually begin to displace the need for native app installs, and eventually the need for mobile app stores. As HTML5 continues to evolve and the underlying mobile platform becomes more accessible to web app developers, what advantage is there in downloading an app, especially when the data seems to suggest that mobile app retention rates are surprising low (25% on average!)? It seems to me that web-based apps make perfect sense for a very large number of mobile apps that today are typically one-shots from the end user perspective. Here at MASL our students have already built some very clever iPhone apps entirely in Safari. Once a shortcut is added to the home screen it is indeed very difficult for the average user to discern whether or not its a native app or a web app. (We intend to do the equivalent of a “Pepsi Challenge” to actually measure this – look for more details in the future.) 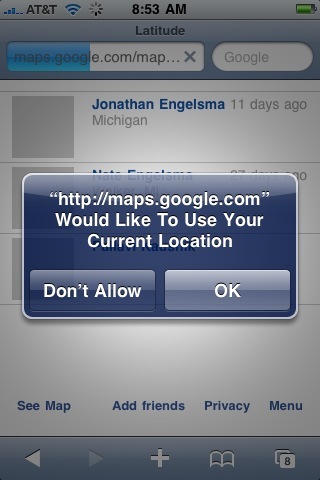 Google Latitude on the iPhone is an early example of using the browser as an alternative to iTunes App Store. That brings us to our second point. From a commercial perspective, Google is shaping up to becoming a pivotal stakeholder in the future mobile application ecosystem. As I pointed out a while back, its raining Androids this Fall. (For a much more up-to-date and complete listing of confirmed and rumored Android devices see the list that TechCrunch recently compiled.) Every Android device I’ve used to-date requires you to become a Google citizen (you need to authenticate with a Google account or create one if you don’t have one) before you can use the device, and from that point on your mobile device is very tightly integrated with the Google cloud, and all the data and services you know and love (email, calendar, maps, search, etc.) are accessible from your mobile without the user installing anything. It makes perfect sense for Google to gradually nudge the mobile application ecosystem towards a model in which the browser is the primary vehicle for third party application providers to access and integrate with Google services and data in the cloud. This also makes a lot of sense for the end user given the current app usage patterns and in the end seems to raise some interesting questions about the long-term viability of the mobile app store model.